The Maybelle floral hair pin is a beautifully uncomplicated and compact piece. A miniature bouquet of flowers featuring a touch of ‘something blue’ through its empire blue crystal details that spray from beneath a perfectly formed clay rose. *LIMITED QUANTITIES – Due to the popularity of the Maybelle hair pin, we have limited materials available to create this design. If you love this pin, we recommend you secure it before we are no longer able to recreate it. The Maybelle floral hair pin is ready to ship. Please allow 5-7 business days for processing plus delivery times. 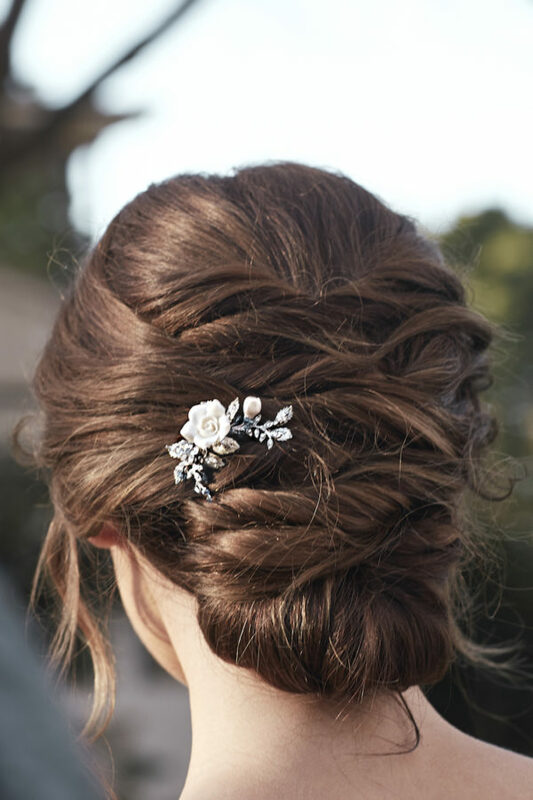 Our Maybelle hair pin is one of our most beloved pieces for romantic updos. 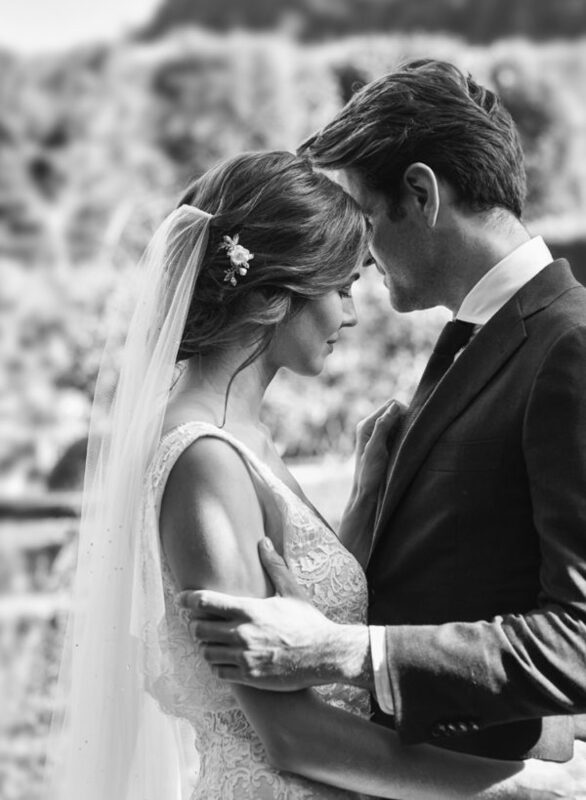 It’s our go-to piece for brides looking for a subtle piece to finish their look. For brides seeking a little ‘something blue’ for their wedding day, the subtle blue details add a touch of magic. We are more than happy to substitute the empire blue details with pearl details, upon request. If you’re planning to wear a veil, Maybelle is designed to sit perfectly to the side of the veil and creates a beautiful yet subtle focal. We recommend pairing this hair pin with a raw edge veil or a crystal encrusted veil to let the beauty of this intricately detailed piece take centre stage. Browse our full veil collection or contact us and we’d be happy to offer a recommendation to suit the Maybelle based on your wedding dress and hairstyle. Details can be reworked into a new style – for example, a hair pin set, hair vine, hair comb, wedding crown or a halo.